In yesterday’s Saintly Sixteen pairing, Pandita Ramabai trounced Marguerite d’Youville 62% to 38% to advance to the Elate Eight vs. William Wilberforce. And, yes, Pandita, much like the Grinch, stole Lent from all the d’Yous down in d’Youville. Today’s battle features Gobnait vs. Paula of Rome for a chance to square off against Ignatius of Loyola in the Elate Eight. While you may think there is scant evidence about the lives of either of these saints, you can always check back to their earlier matchups to help fill in the gaps. Gobnait defeated Hrotsvitha and Paula of Rome bested Marcella of Rome. This also marks the final matchup of another wild and wacky week of loony Lenten learning. We’ll be back first thing Monday morning for the final battle of the Elate Eight as Zenaida faces Nicholas as Myra. Then it’s on to the next round! As the female leader of a convent and a community in medieval Ireland, there are not any writings or quotes preserved from Gobnait. However, this line from John Chrysostom sums up well her devotion to our honey gathering friends. Gobnait’s name is often anglicized as “Deborah” – a name which means “honey bee.” And this is no accident. She is best remembered for her work raising bees at the convent she helped to establish. And then there were the times she organized the bees to the defense of her community. For example, the cattle rustlers who were strongly encouraged to leave the area by a swarm of Gobnait’s bees. In some of these legends, the bees were transformed into soldiers to provide safety and security for the community. According to Celtic tradition, when the soul departs from the physical body it departs as either a bee or a butterfly. 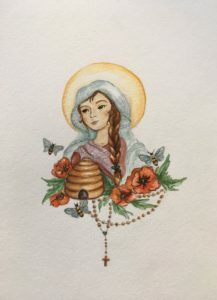 Gobnait stayed in Ballyvourney until she died – it was the place where God had given her a sign to “wait for her resurrection.” The bees she worked with remaining as a sign of God’s promise. Paula of Rome was born into a family of distinction, and she married well too. She lived a life of luxury, wearing the finest silks and ordering slaves to carry her around the city. Then, upon the death of her husband and her daughter, Paula’s life changed. She went on a pilgrimage and began to give all of her riches to the poor. People became nervous and considered her generosity reckless. Then Paula became friends with St. Jerome. She left her children, moved to the desert, and took her asceticism very seriously. Maybe even too seriously. After all of these years, we know about Paula’s great generosity to the poor. We remember that she founded a monastery and three convents. And, we also have the enduring knowledge that Paula of Rome…didn’t bathe. 105 Comments to "Gobnait vs. Paula of Rome"
When Brooks offstage was hissed — how Trinity was missed! As bracket picks they missed — they’ve fallen off the list. Poor Rudolph masochist — I don’t think he’ll be missed! Good Tabitha is missed — I had her on my list! Now thirteen of them he’s missed — unlucky lyricist! I kept trying to sing this to “I Am the Very Model of a Modern Major General” and it almost worked. I’ll have to go find my recording of Mikado. In this week’s final show tune tribute, we salute Gobnait and Paula of Rome to the tune of “Ring of Keys” from Alison Bechdel’s autobiographic musical “Fun Home.” For those unfamiliar with this musical and song, a YouTube link to its performance at the Tony Awards has been included. It is outstanding. That saint with the name I can’t pronounce. “Protectress”: Her claim to fame. She made foes wish they never came. From protection lines you’re drawing. But you knock it down. Marcella – and moved to the next heat. So, she traveled east with Jerome. Founded four abbeys and made her home. And I feel my heart asking, “Why? Why are we the Madness fans who choose why one gets crowned? And Gobnait brings her foes to their knees. “Her killer bees”—!! That’s fabulous! I really love this song and the performance is amazing. (I wonder what that kid is doing now. What a little actress!) Thanks for posting the YouTube version; it really helps for those of us singing at breakfast. Our trip to NY that year was right after it ended. How wonderful that you got to see it. Do you know if Sydney has done anything else since then? She played Mary Lennox in The Secret Garden with Manhattan Concert Productions on February 21 and 22, 2016. She is also a series regular on an AMC show called The Son (I am not familiar with it). So, yeah. Not bad for a 15 year old! I also go to see The Color Purple which was phenomenal! I enjoyed reading a fictionalized version of Gobnait’s ministry in Kristin Gleeson’s book In Praise of Bees. Gobnait gets my vote. Quite the moving expression of finding “belonging”. Thank you for fabulous good morning song. Thanks for including the video. Great job as always! I want you to know in honor of yesterday’s limerick I went home and made a curry for dinner. Wow! Thanks for introducing me to Sydney Lucas. So, so talented. Gobnait is a name rather funny. The Saint’s known for bees and for honey. Brings a halo both golden and stunning. Paula’s patience could fill quite a tome. For the woman endured Saint Jerome. Fed the poor of her day. May her halo be golden, not chrome. Your rhymes are really clever, Diana. “The woman endured St. Jerome” rhymed with “chrome”–hilarious! Thank you, Diana! Made my day. ” Prayed against those who preyed” is my line of the day! Honey bees need all the help they can get! Go, Gobnait! As a beekeeper in a big city, translation, backyard is the size of three parked cars, we share the backyard with our honeybee hive, flowers, and the grill. Summer evenings finds us grilling, conversing, chilling with a glass of wine and watching the honeybees flight path as they return to their hive. I often wonder if the ten commandments are the only true piece of bible. How many times has the bible been translated and with each translation how many changes from its original conversation. And to add to this dilemma many preachers read portions of the gospel than proceed to tells us what it means in place of a sermon. Gobnait all the way. God bless. I recommend the five volumes of “A Marginal Jew: Rethinking the Historical Jesus,” by John P. Meier. It is especially good on the criteria for possible historicity of a pericope (love that word, which I learned from these books) or particular passage of scripture. This is part of the Anchor Bible Commentary. Peter Enns: How the Bible Actually Works. Light-hearted, often LOL funny, yet cogent premise. Reading it now and highly recommend. Tend to agree more with Wesley about cleanliness, but giving my vote to Paula the editor anyway. I vote for Paula for her intellect, her facility with languages, her hard work of translating the Bible from Hebrew into Latin, her voluntarily choosing poverty while using her fortune to help the poor, and for her adventurous spirit. I do like bees, though. To misquote– Lord, an stinketh. really misquoted! Should have read — Lord, She stinketh. But didn’t everybody back then? I don’t think bathing was a thing till last century. BTW, welcome back! That’s a common misconception, actually. Climbing into a large personal tub of hot water on a regular basis was a luxury reserved for the rich until the invention of indoor plumbing and mechanical heaters, but there are many other ways to get clean and they’ve all been popular for millennia! Ordinary folks have often favored a good scrubdown with a small bucket of water and a cloth, and keeping their undergowns/shirts/hose changed daily did a lot to absorb sweat and keep the harder-to-launder outer garments smelling sweet. Public bathhouses have also flourished in many cultures – the most famous have been in Rome, Japan, and Turkey, but even in London you could once spend a small coin to wash in the common “stew”, which priests in the medieval era sometimes railed against as a human soup of sin (all that exposed flesh)! And of course, there’s always a wash in the river or lake when the weather permits. Our exact standards (daily, weekly, with soap, with oils, wash the hair or just brush the dirt out daily) vary with culture and time, but we humans have always preferred to smell nice and keep tidy! No wonder Paula stood out in a crowd. Hi Susan! Actually, bathing was a thing in Europe through the 16th century. In the Middle Ages and Renaissance, most people couldn’t afford private baths, but every little town had its public bathhouse. These declined in the 17th century and things got progressively nastier. I don’t know the history after that. I’m a Renaissance reenactor, and “nobody bathed” is one of the misconceptions we most enjoy fixing! Well, I walked into that one! Thanks for setting me straight, Barbara and Tessa! The Romans certainly did bathe. Paula lived c. 400 CE and there were at least 11 large public bathhouses in Rome, with hundreds of smaller baths and over a thousand fountains for people to draw water. Jerome was commenting because Paula did not conform to the standards of the time regarding personal cleanliness. In addition, if the linen worn closest to the body is changed and washed regularly people can go a long time without bathing and not develop an offensive odor. It’s a lot easier to wash and boil linen garments than it is to boil a person! While Paula probably didn’t have access to modern baths, that did not excuse her antipathy to washing and to putting on clean clothing. Mind you, we have no idea how often Gobnait washed and changed her clothes either. as far as I care you may smell how you please. we can remember our baptism there? Despite your brain and your loving care. I seem to have caught a dang rhyming disease. I thought you were channeling John Donne with this! Hear, hear! You have Evangelism Disease, you acidic person, you. Mary, Martha worried, was whom Jesus loved the most. And everyone’s concerned about Evangelism Disease. But everyone knows Evangelism Disease did the deed. You all are amazing!!!! Thank you! Delightful, Susan! Thank you so much for sharing. There is no credit given for the artist that did the image of Saint Paula of Rome. Did someone think no one would notice? Icon artists usually don’t give their names. It looks like it’s on a wall in a church, doesn’t it? It’s on the Catholic Online website. I love Gobnait’s story and her bees, but I love Paula and her importance for Bible translation even more. Had to vote for Gobnait and for the bees. Oh dear, I was hoping to be more inspired today. The image of the soul leaving the body as a butterfly or bee is lovely and it was tempting to vote for Gobnait because of it. However I voted for Paula last time, and have held my nose and voted for her today because of her transformed life and her little known influence. I appreciate Saint Paula of Rome’s knowledge that a clean exterior was not indicative of a clean interior. For that and for her careful work of Bible translation, I’m tempted to vote for her. That be had, I’m a wee bit Irish and I’m really drawn to Saint Gobnait. Her friends the bees, without whose lpollinating abor we would shortly be doomed, need all the help they can get these days.
. . . whose pollinating labor we . . .
Can we get an edit button Scott & Tim? Though I loved Carol Howard Merritt’s description this morning, it was all about the bees for me. 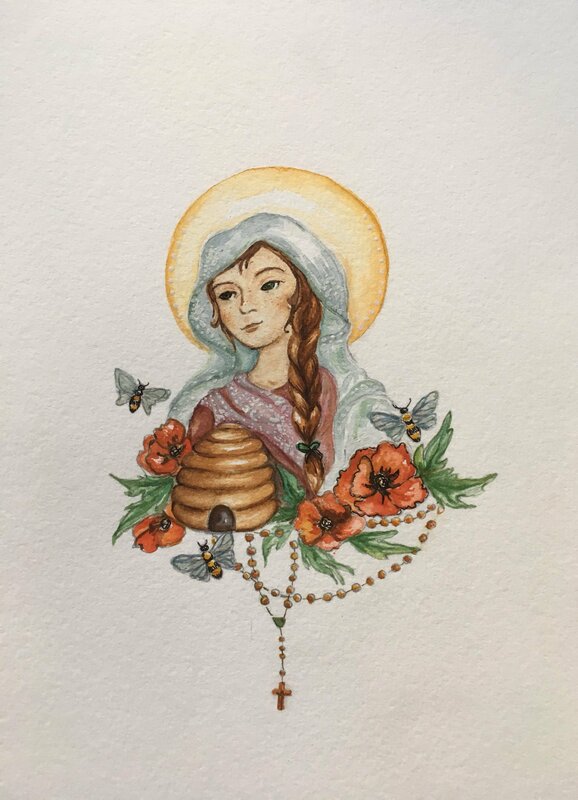 St. Gobnait and her bees for me. She’s a saint to whom I can relate. St.Paula comes across as somewhat deranged, with her clean body/unclean soul philosophy. I agree. I voted for the sweetness of bees. Besides, we used to have eight beehives in a farmer’s apple orchard, plus one on the flat roof of an addition to the house we lived in at the time. Yeah (your second sentence). At this point the choosing is almost arbitrary, given how these saints made their lives a witness. So, Ireland is at least as good as any other reason. Maybe Paula was into water conservancy ahead of her time. I’ve always thought modern U.S.ers bathe far more than they need to and consequently waste an inordinate amount of water. John Wesley was right . . . remembering the Beacon Day Center at Christ Church Cathedral in Houston, TX (serving the homeless and poor), and all other laundry facilities – and the bees – voting for Gobnait. My vote is for Hrotsvitha. Only . . . she’s not here. I think I would have concentrated on the Vulgate instead of on how Paula stank. I would vote for the bees, but they’re not the nominee. I’m put off by the “for Ireland” contingent. It’s possible I might not vote today. Ignaz is going to wipe the floor with either of these. What to do . . .
My vote was with Hrotsvitha as well, but I went with Gobnait today. It might be that spring flowers are making me think of bees. The non-bathing thing put me off Paula completely. The cleaner Gobnait is a much more appealing role model. Though not very godly I can deal with cleanly and, besides, I love honey. Speaking of smells…. I am thoroughly enjoying a read of Holy Grounds, delivered yesterday by the hard-working delivery minions of Amazon. Loving PS to Tim, when we ladies are purchasing perfume, the finer establishments have a cup of coffee beans at hand with which to cleanse the palette nasal. I voted for Gobnait because my sister’s name is Deborah, and I like bees and honey. My heart goes out to Paula as her refusal to bathe is frequently a result of severe trauma particularly among young women who have been sexually abused. Interesting information at the end there, Mary Jane. A compassionate observation. Prayers for healing and courage for girls and women who have been sexually abused. How many came to faith via the Vulgate? How many via bees? Go Gobnait, naturalist honoring God thru his creation of bees . Wish our world respected pollinators now the way Gobnait did ! I’ll take trained bees over holy smelliness any day of the week! Paula…not bathing. Voted for Gobnait. Gobnait is a little more down to earth for me, whereas St. Paula’s unclean b9dy clean soul idea kind of repulsed me and I too thought it wasn’t too normal. We also have a neighbor who is a hoarder and lives in the next set of buildings in front of where I and my significant other are at. The man also never bathes and I kind of had that to relate to when reading through the vignette on Paula. Instant choice of Gobnait! So many cogent comments! I, too, was ‘put off’ by Paula’s bodily care habits, much like others of her own time and community. I was bee-guiled by Gobniat, however. Today’s easy peasy for me. Go Gobnait! Paula sounds like she always went 110%, and she liked to show off! When she was a Roman matron, she made sure everyone in town saw her fancy duds. When she practiced asceticism, she went so far with non-bathing that even St. Jerome thought she should put on the brakes. She had a huge fortune, and she gave it all away through the convents and monastery she founded, and through other good works. She might have irritated me had I met her in person, but for her high spirits, charity, and scholarship, I’ve voted for her. Paula for me, for the same reason I voted for Hrotsvitha in the earlier round. Gobnait’s story sounds like beautiful folklore (I adore bees) , but in the end I prefer the real life saints with all of their warts and odors. I have completely OD’d on asceticism and self-mortification this Lent Madness, so I had to vote for Gobnait even though I admire Paula’s scholarly work on the Vulgate tremendously. She left her children did it for me. As to the bathing issue, there’s generally not a lot of water in the desert. St Gobnait is the bee’s knees for me. These two were, to me, lightweights in comparison to other matchups. I went with Gobnait since bees are endangered, at least in the USA. Perhaps if Paula had bathed, she might have attracted my devotion. BEES OF FURY. BALLS OF STEEL. GO GOBNAIT! As a professional writer/editor, had to vote for Paula, the editor. I can see I’m outnumbered, however. Gobnait anglicized is Deborah? How can I not? I love the idea of the “bee army”…surely an excellent metaphor for today’s attempts to protect our environment. I am not a champion of asceticism, but I try to remember that we benefit from centuries of accumulated wisdom and science, as in Jesus’ words that “there is much you are not ready to understand, but I will send the Spirit who will guide you.” Putting our 21st sensibilities onto 3rd century lives can blind us to what their example was trying to offer. 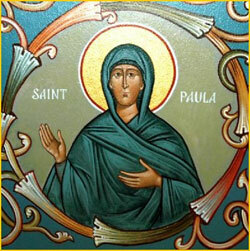 For her care for the poor and for her work on the Latin Bible, it is Paula for me today. Woof! Lent Madness is coming down hard in favor of personal hygiene today! Celebrity Bloggers, you have such power! Maybe Gobnait would have overtaken Paula anyway, but Paula’s anti-bathing Quirk has clearly helped wash her out of the running. However, I applaud Carol Howard Merritt for not shying away from her saint’s weirdness. If the saints were perfect, how could they be inspirations and models for us? I’m sorry, but Paula lost me over the hygiene issue. She was at best deluded and at worst passive-aggressively defiant, and likely a stumbling block to the faith of others. No, dear Paula, a clean body does NOT mean an unclean soul; and the fact that in you a pure soul happened to dwell in a filthy body was a coincidence, as you would have learned if you had responded to Jerome’s entreaties just once by bathing. So in making my choice I didn’t even have to think about the bees, except to the extent that Paula’s refusals probably gave poor Jerome hives. But for the record, I agree with all the good things everybody else has been saying about them. “hives”; I saw what you did there. Years ago a professor of Spanish literature at U.T in Austin told our class about a nun in Spain who bathed that she had not bathed in 60 years. Seems that the cleanliness of the Muslim populations of Spain and Portugal caused some Christians to think that they should distinguish themselves from these persons by not bathing. “La gente olía,” he said, “The people smelled.” All honor to Paula for her generosity to the poor, but I disagree that an unwashed body necessarily means a clean soul. I wish she had extended more charity toward those who lived close to her, the nuns who were signaling that she could use some Irish Spring. My vote goes to Gobnait and the bees. Again. So this is one of those honey / vinegar contests? As one of those with a honeybee moniker, I have to vote for Gobnait. God, bless Gobnait, again and again! Anyone who is friends with bees deserves to win, and to win big. You go, guuuurl! Celtic bee whisperer all the way! When Paula of Rome was victorious in a previous round, her narrative was more appealing. Sadly she is headed for the barn round. Go Gobnait! Honey can be used in soaps too! If Gobnait wins, my church’s traditional chocolate and champagne “Break the Fast” following the Great Vigil may have to give way to honey treats and mead (honey wine). I just happen to have a few bottles of mead from the last batch I brewed! I’m in vaycay… thot today was Saturday and didn’t dive into the madness of Lent early. I’m shocked. SHOCKED! That Gobnait is killing Paula. My consolation prize is getting to know St Paula of Rome. And, I learned how to say Gobnait. I ‘paid the pattern’ at Saint Gobnait’s shrine this morning and during the hour of my visit there was a steady trickle of pilgrims to the site. Pilgrims leave little personal momentous as an offrings one of the sweetest was bowl with a little posey of Mayflowers & honeycomb. I said a prayer for everyone who voted…..for Gobnait!